Chris Whittingham, 28, from Norwich, took part in a donor chain and had a kidney transplant from an altruistic donor. Chris, a married hotel receptionist, had already had a transplant from his stepfather but it had failed. 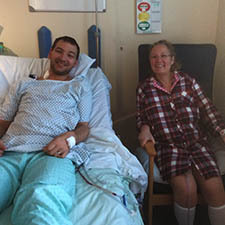 He received the second kidney from the altruistic donor after signing up to the paired and pooled scheme. His mother Elizabeth was aged 50 and donated on his behalf to another patient in the scheme. He said: "I had multiple treatments for rejection. I felt very despondent that we would have to go through it all again. "My wife was hard hit when we were told the first transplant had failed. The most debilitating symptom of the kidney failure was the exhaustion. “It was a fantastic feeling when the phone call came to say that they had found a perfect match kidney in the first run of the paired pool scheme." "I was happy and thankful, when I was told it was from single donor out of the kindness of his or her own heart, it made me feel like there are still good people in the world. Because of how the paired scheme is run I actually know nothing of the donor. "I felt loved that I had someone willing to donate for me to help me get the best match possible. My wife was over the moon that I would be better and we would be able to move forward with our lives again. "Organ donation is giving the gift of life to someone - what could be better than that?"